Mid-America Regional Council and BikeWalkKC are once again leading regional efforts to plan and promote Bike Month in May 2015. We need your help to ensure we include all events and programs planned around the metro area. This information will help us to create a central calendar and event list here at kcbikemonth.com and to plan for media placements this spring. Please provide as much information as you have at this time, and contact eric.rogers@bikewalk.org or abartlett@marc.org with updates or questions. Please provide as much detail as possible (dates, times, locations, web site links, etc.). If you don't have firm details yet, that's OK. Tell us as much as you can at this time. 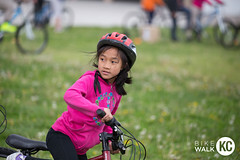 Bike Month is organized by the Mid-America Regional Council, BikeWalkKC, local city governments, and many community organizations. To learn more or participate contact info@bikewalkkc.org or 816-205-7056 x4. This entry was posted in Uncategorized on February 27, 2015 by BikeWalkKC.